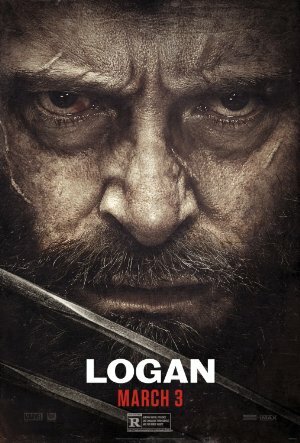 Logan is the third film in the X-Men franchise featuring “Wolverine” (Hugh Jackman – Movie 43, Butter), who has been practically invulnerable through all of his previous films. Now it is 2029 and the adamantium that was bonded to his skeleton is slowly but steadily killing him. He, “Professor Xavier (Patrick Stewart – Christmas Eve) and “Caliban” are among the few mutants who have survived a virus intended to end the existence of those who possess the X-gene. They live in an abandoned industrial facility in Mexico. The events that led to Logan working on the U.S. side of the border with Mexico as a limo driver in order to support himself and Professor X are never fully explained to the audience. We know that Professor X is suffering from seizures. Logan has to get medicine to prevent the seizures from less than legitimate sources. Given the dangers inherent in the man with the most powerful mind on the planet losing control of that mind during a seizure, this is important work. Logan is sought out by “Gabriela Lopez” (Elizabeth Rodriguez – Side Effects), a nurse who was employed by Transigen as a nurse to care for cloned children who were created with DNA from mutants. She helped one of the kids, “Laura” (Dafne Keen) escape and they are being pursued by “Donald Pierce” (Boyd Holbrook – Milk, The Host) who is the head of security for Transigen. Gabriela hires Logan to take Laura to “Eden.” Eden is supposedly a refuge for mutants near the U.S. border with Canada in North Dakota. The money promised by Gabriela would allow Logan to fulfil his current dream solution to the situation he is merely existing in and so he agrees. But he returns to find Gabriela dead. So he takes Laura and Professor X and heads toward Eden. Pierce pursues and what transpires is filled with frenetic confrontations intermixed with moments of major emotional experience for Logan. Does Eden really exist or is it a fictional creation of the authors of the X-Men comic books? Did the other children that fled the Transigen facility make it there? Is it a safe place? All of these questions and more are answered during the journey there. There is also an encounter with a nice family along the way which serves to show Logan there are reasons to want to live. Over the past 17 years Hugh Jackman has been portraying the Wolverine and his work in bringing this character to life on the big screen has improved with each film. If this is to be his finale in the role (and no matter what happened in this film, anything is possible in the X-Men universe), he went out giving his best. If there is a way for Patrick Stewart to give a weak acting performance, I’m not aware of it. Even when reading the novel “A Christmas Carol” for the old Mark and Brian morning drive radio program in L.A., he was brilliant. He is here as well. The battle scenes between the Wolverine and perhaps the most difficult opponent he has ever faced off against are worth the price of admission alone. There are a few “scratching your head” moments in the finale but they are the only minor flaw worth of mention. Long live Logan. Plot: In the near future, a weary Logan cares for an ailing Professor X somewhere on the Mexican border. However, Logan's attempts to hide from the world and his legacy are upended when a young mutant arrives, pursued by dark forces.